02 Dec 2012 Ramsgate U.K.
A fantastic informative website. Perhaps a members login area could be considered to exchange and share questions and answers etc. Brilliant, so well put togther. The functionality puts other commercial sites to shame. Do you have an Excel or Open Office template that your visitors could use to log their own models? Just thinking that I want to put a link to your site from my spreadsheet for each model. Hi, brilliant site, fantastic effort to add all that detail. One suggestion for navigation - Can you add buttons for moving straight to next/previous catalog item? I wonder if you will continue the information on from 1990 through to current day? 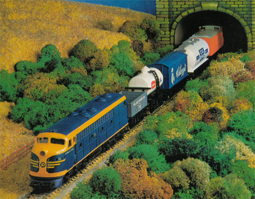 The best site for detailed and correct information on Hornby. Brilliant!! Any chance of doing the same for Mainline, Airfix and Bachmann. Well what can I can I say? What a fantastic website. A jolly good find. Only one small thing, why no World of Thomas the Tank Engine? All the girls here in packing at www.hornbyshop.com absolutely admire your devotion to the Hornby brand. We know how much work you put in, and our boss here talks to his customers on how much he loves your website too. Good luck. Hornby Shop W.A.